Have your Sales & Marketing divisions been waging a silent war over the years—battling for resources, jockeying for position with the executive team, operating in bubbles of their own? Welcome to the Great Divide of the business world. No one’s quite sure when this schism first occurred. Probably somewhere back in the Dark Ages. But if this division is still taking place within your company, you’re squandering opportunity, losing sales and stunting your business growth. The often contentious relationship between Sales & Marketing divisions of a company can be one of the most debilitating dysfunctions of standard business operations. Even smaller enterprises that have a solitary employee wearing both hats can experience a case of sales and marketing schizophrenia. But aligning these disparate efforts into a two-pronged, but unified, sales engine should be a primary goal of any firm. The good news is that there are more tools available today to bridge this divide than ever before. Companies that have already done the hard work of getting the Sales and Marketing divisions to smoke the peace pipe must create processes to ensure the peace. One set of metrics translates to “a singular truth.” This allows organizations to gauge the velocity and configuration of the sales pipeline and to make real-time adjustments when problems or opportunities arise. Highly-aligned organizations achieved an average of 32% year-over-year revenue growth - while their less aligned competitors saw a 7% decrease in revenue. (Source: Sales Enablement: Fulfilling the Last Frontier of Marketing-Sales Alignment, Aberdeen Group, September 2013). Marketing automation software can monitor and audit content-based marketing initiatives, providing not only well-qualified leads for sales personnel, but also helping track those leads throughout the discovery, research and purchase phases of the sales cycle. When Sales & Marketing teams align with technology, the effectiveness of their content, the gains in demand generation and enhanced sales opportunities are exponential. According to the Aberdeen Group report, "Sales Enablement: Fulfilling the Last Frontier of Marketing-Sales Alignment" (September 2013), 84% of the best-in-class organizations empower marketing with access to CRM. The report also identifies marketing automation capabilities such as lead generation, lead scoring, and lead nurturing as important drivers of marketing and sales alignment in top-performing organizations. 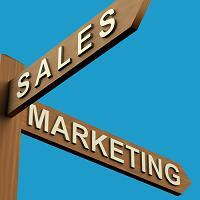 Those figures indicate why Sales & Marketing Alignment is such a hot topic today. Alignment encompasses many things- first & foremost, communication. If your two divisions can’t -or won’t- work together in a unified process, all the tools and free exchange of customer-friendly information will be rendered ineffective. But once you’ve leapt that essential hurdle, reinforce this alliance by establishing common milestones, one (not two) set(s) of metrics, and strategic investments in initiatives such as content and technology that enable the efforts of both divisions. Investment in Marketing initiatives and tools must be strategic. If the resources being implemented are not meeting the demands of the Sales Division, e.g., providing them with robust leads and resources to guide those prospects through the sales funnel, it’s pointless. And marketing investment should not be one-size-fits-all. Different products and different customers often times require different solutions. Agree upfront on aligned strategies and outcome. When creating resources for accounts and buyer personas, Marketing must begin by understanding the opportunity within those accounts and the goals that the Sales team has set. It is then incumbent upon Sales to trust Marketing to devise the right tactics for the best results. Plan thoroughly. Everyone’s busy operating these days in multi-channel, real-time marketing environments that create daily new challenges. But investing the time upfront in thorough planning and coordinated strategies, as well as fostering personal relationships between teams will help Sales & Marketing results flourish! Sales & Marketing alignment isn’t a one-time event. It needs to become a standard operating procedure if revenue generation and company development are to remain on a consistent growth track. Encourage your teams to follow up on planned initiatives, and be sure to track progress and mandate accountability. Finally, a regular analysis of major customer wins and losses will indicate how, when and where to concentrate your future Sales & Marketing alignment efforts.